Nicola Grimaldi in the title role of Idaspe (Venice 1730), with the soprano Francesca Cuzzoni. Antonio Maria Zanetti the Elder, Nicola Grimaldi detto Nicolino e Francesca Cuzzoni. Venice, Fondazione Cini, Gabinetto dei Disegni e delle Stampe (from the album of caricatures by Zanetti, folio 12). Photograph: Matteo De Fina for the Fondazione Cini. To the modern viewer, period caricatures offer little indication of the acting prowess of star castrato Nicola Grimaldi (1673–1731), known internationally by his stage name ‘Nicolini’, depicted below in the role of the warrior prince Idaspe, who like Goliath strangles a lion with his bare hands. And even though men of taste, theorists, poets and critics, disapproved of audiences’ penchant for sensational battle scenes, they unanimously praised Grimaldi for the expressiveness, dignity and specificity of his action and considered him the greatest actor of his time on the operatic and spoken stage alike. In recent decades, new approaches (including sociocultural, political and production history as well as diva and reception studies) have greatly enriched opera scholarship. 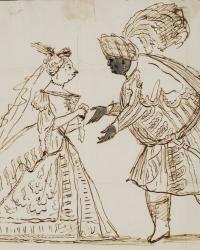 But, being the least documented and thus most elusive aspect of eighteenth-century opera, its dramatic performance practice remains under-researched. My interest in it grew out of my work as a professional singer and research on star castrati, namely Grimaldi and his younger contemporary, Farinelli. Perusing scores, libretti, visual evidence, letters and newspaper reviews from a performer’s perspective enables me to detect clues regarding operas’ dramatic realisation in practice and reconstruct the salient features of not only the vocal, but also the dramatic aspect of singers’ styles. Analysis of Grimaldi’s well over 100 roles yields fascinating insights that challenge traditional views of the performance practice and role of star singers in eighteenth-century opera. Not only was he the foremost star singer of his generation and one of the most influential actors of the early eighteenth century, but, remarkably, he exerted aesthetic influence on opera productions as a stage director as well as collaborator and promoter of composers and poets. His contribution to cultural exchange between leading opera centres, stylistic development and aesthetics during his illustrious forty-seven-year career rival that of any of the leading composers and librettists of his time.